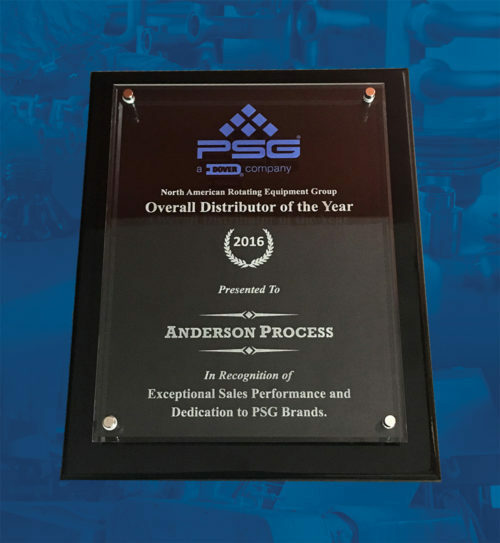 Home » Anderson Process Wins 2016 PSG Distributor of the Year Award! Anderson Process Wins 2016 PSG Distributor of the Year Award! We are proud to announce that PSG (Pump Solutions Group) has awarded Anderson Process with the 2016 Distributor of the Year Award! Anderson Process was announced as the 2016 distributor of the year in recognition of exceptional sales performance and dedication to PSG Brands. PSG is the global leader in the manufacture of pumps, systems and related flow-control solutions for the safe, efficient and reliable transfer of critical and valuable materials. PSG features top brands such as Almatec, Blackmer, EnviroGear, Griswold, Mouvex, Neptune, and Wilden.